Al-Menaa stadium has a cable-stayed canopy formed by serpentine pipe trusses and covered by a tensile membrane with ridges and valleys. Every couple of months, when non-Iraqi representatives of the design team, mostly from the U.S., visit the site of the $100-million Al-Menaa Sports Complex in a suburb of Basra, they move in and out of the war-torn nation with as much secrecy as possible. All travel plans and meeting locations are kept confidential. They alert only one construction executive to the trip. While there, they have armed guards escorting them at all times. Instead of a construction fence, a precast-concrete security wall surrounds the site. "We even have to be careful about how we send e-mails about travel to the site," says one of the members of the project's lead architect, 360 Architecture, Kansas City, Mo. "Our counterparts on the construction side have had their lives threatened," he adds, declining to be named in quotations for this article for reasons of safety and security. The Al-Menaa complex is the second of three 360 Architecture sports venues in Iraq. 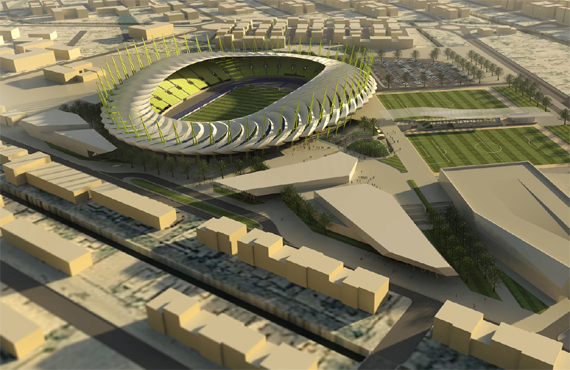 The first project in Iraq is the $700-million, two-stadium Basra Sports City, set for completion late this year. The third is the 30,000-seat Al-Najaf stadium in Al-Najaf, which is trailing Al-Menaa. The 65,000-seat Basra stadium project was prompted by the selection of Iraq to host the 2013 Gulf Cup of Nations soccer tournament. The Basra, Al-Menaa and Al Najaf projects are part of a national program, led by the Iraq Ministry of Youth and Sport, Baghdad, to build a network of athletic facilities. The goal is to build 30,000-seat stadiums in each of Iraq's 18 provinces. Currently, there is an estimated $1.5 billion worth of sports construction in Iraq. For all of 360 Architecture's work in Iraq, "our staff's personal security is paramount," says the architect. All the precautions have paid off, he says. "We have had no safety or security issues with our staff to date," he notes. 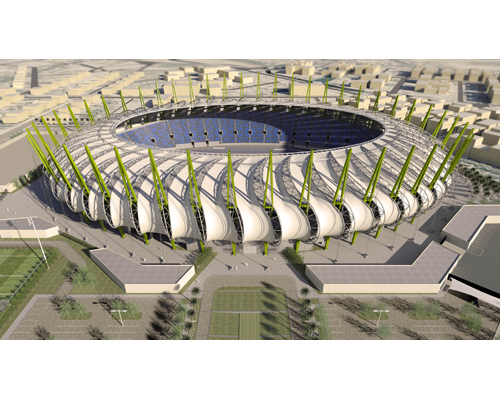 The centerpiece of the Al-Menaa project is a 30,000-seat stadium with a structural-concrete seating bowl covered by a 30,175-sq-meter, fabric-covered cable-stayed steel canopy structure. The geometry is challenging. 360 Architecture is part of a design-build team for the complex, led by Anwar Soura for General Contracting Co., Amman, Jordan. Anwar Soura is part of the Abdullah A. Al Jiburi Contracting Co.
As with the Basra Sports City project, the ministry selected the 360 Architecture team through an international design competition. The team consists of Cairo-based associate architect RMC; New York City-based structural engineer Thornton Tomasetti (TT); and New York City-based mechanical-electrical-plumbing-fire protection engineer, WSP Flack+Kurtz. Work on the stadium, which is about 40% complete, began last July. The design is currently 80% complete. Basra—located along the Shatt Al-Arab River, 340 miles south of Baghdad near the Kuwait border—is Iraq's second-largest city and its main port. The stadium's canopy, open in the center over the field, relies on 48 steel masts and rigging that reflect the port's many tower cranes and ships. The membrane's undulating surface of ridges and valleys reflects waves on the water, says 360 Architecture. For the design team, security and safety aren't the only issues that distinguish the project. Not much has been built in Iraq in about 40 years. The Ministry of Youth and Sport itself is only about 10 years old. Government tendering is also a "growing process, which is pretty fragile," says the architect. For example, the stadium is designed to international codes and standards. When the project began, Iraq had no building code. The design team submitted a list of international codes that would be used and got approval for their application on the project. Compounding that is a lack of construction sophistication. "The challenge is that they have limited relevant construction experience for projects of this size," says one of the members of TT's team, who also declines to be named for reasons of safety and security. "The level of sophistication is really low, so we are attempting to keep things as simple as we can, which is a challenge on a stadium with a tensile roof." Even third-party inspections fall below the design team's comfort level. "They are not as rigorous or reliable as they are in the U.S.," says one project source. Design-build delivery makes quality control even more difficult. All input from the design team about construction deficiencies goes to the contractor, rather than to the owner. "Where it goes from there, we don't know," says the architect. "It's a challenge to ensure that things we're citing get followed up on." As a result, both the architect and the engineer are pressured to watch over construction more closely—though they are not contractually obligated to do so. The 360 Architecture team has full-time site representation. Still, "[we] spend a lot of time wondering if we've caught all the [field] deficiencies," says a TT engineer. To try to make things easier, the design team is sharing its building information model with the contractor. Moreover, the engineer includes much more detail on the structural drawings. "We essentially give them shop drawings," says the TT engineer. For example, exact bending details for the reinforcing steel in the cast-in-place concrete seating bowl are included, with cut lengths. The design team also participates in procurement negotiations, the qualification of suppliers and scheduling. "In other projects, we would be hands-off," says the architect. There are also challenges related to different cultures and customs. Typically, in Iraq, concrete block has no reinforcing steel. The design team was vigilant in making sure the block walls had rebar. And Iraq's own technology infrastructure is absent, which complicated design. From a building infrastructure standpoint, the designers had to provide systems, such as for ticketing and concessions, that could operate in an archaic manner. But the team also has to provide a backbone for updated maintenance and operations once Iraq develops its own modern infrastructure. "For these projects, we've had to be cognizant that the local environment will transition over the next five years," says the architect. "Our stadium will be set up for it, and hopefully the rest of Iraq will catch up." Why did the design team take on all the headaches? "It's cool to help the Iraqis rebuild," says the TT engineer. In addition, in 2009, when work on the project's design competition started, design firms were hungry for work because of the recession, he adds. The design team isn't the only entity faced with challenges. Anwar Soura has its own issues, especially concerning coordination of the many parties, including its own design team and the ministry's local representative, AMBS. One problem is that government regulations are a moving target—they keep changing throughout the project, says Tariq Momika, Anwar Soura's vice president and project manager. Momika confirms the absence of skilled subcontractors experienced in sports stadiums. For Anwar Soura, site security is also an issue, even though Basra is a pretty calm city. There are also headaches regarding the safe passage to the site of imported goods. The myriad obstacles did not stop 360 Architecture from offering one of its most complex cable-stayed coverings, with many ridges and valleys and serpentine trusses. Momika points to the "high-level design for the roof" as Anwar Soura's single-biggest construction challenge. The seating bowl is standard cast-in-place construction—but not for Iraq, creating a concern about concrete quality. The concrete frames are spaced on grid lines approximately 12 meters on center around the stadium bowl. The lateral systems is shear walls in the radial direction and moment frames in the circumferential direction, to resist wind and seismic forces. The canopy structure, covered by a polytetrafluoroethylene tensile membrane, resembles a bicycle wheel laid flat. The wheel bears on 48 steel-pipe truss masts, each with three chords. The masts are equally spaced outside of and around the perimeter of the bowl. A steel-pipe funicular–shaped outer compression ring, located four meters above the top row of seating, runs continuously around the structure and connects the 48-m-tall masts. The compression ring resists tensile forces from the lower suspension cable and valley cables. It also collects the canopy's lateral forces and transfers them to vertical cable bracing at four locations. The suspension cables radiate toward a funicular-shaped inner tension ring made of eight steel cables. The tension ring resists the upper and lower suspension cables and collects the canopy's lateral forces. The upper suspension cable at the top of the mast is resisted by a single backstay cable tiedown that terminates in the foundation. The mast base and tiedown are founded on a pile cap on top of an auger-cast pile foundation. A tri-chord serpentine-shaped steel-pipe truss spans from each mast, sweeping horizontally to the inner tension ring and beyond it, cantilevering up to 10.5 m to form a forward span. The horizontal tri-chord trusses—essentially the wheel's spokes—also cantilever beyond the masts to create backspans. "It is challenging structurally to work out the forces in the serpentine shape," says TT's canopy designer. "Engineering-wise, it is much easier just to connect the dots." The serpentine trusses cantilever 10.5 ft beyond the tension ring to keep the suspension cables in a pure radial layout, says the engineer. They culminate at an inner ring of steel-pipe trusses. The upper chord of each tri-chord serpentine truss forms a ridge of the membrane. The inner edge of the membrane is connected to the inner ring of pipe trusses, 32 m above the event level. The inner ring of secondary trusses creates a catwalk that supports lighting while also providing torsional support to the serpentine trusses. There is a span of 46 m from the outer circumference of the membrane to the inner edge. The membrane has 12-m-wide standard-translucency panels, with 12.5% light transmission, between serpentine trusses. The engineer was required to provide cables that outline a ridge-and-valley profile for the membrane, to avoid a flat surface that would allow rainwater to collect. A high-translucency membrane with 38% light transmission, much like a clerestory, extends between serpentine truss bottom chords. The key to making the canopy as structurally efficient as possble is regularity and repetition. For this, the design team had to adjust the architect's original competition concept to make the components of the roof repetitive, both to keep down the cost and to ease fabrication and erection, says TT. For example, unlike in the original concept, there is a constant distance between the tension and compression rings. The shape adjustments reduced bending forces in the compression ring, says the engineer. From the outset of the project, the team capitalized on digital tools. During the competition, TT used software called Grasshopper, a graphical algorithm editor that works with 3D modeling software called Rhino to allow users to explore various shapes in real time using generative algorithms. The software enabled the engineer to work with the architect to develop multiple complex concepts over a three-day period. During schematic design, TT continued development of the Grasshopper model with the architect, incorporating additional parameters into the model to work toward the final design. The parameters allowed for the geometric manipulation of items such as the height of the masts, the roof pitch and the magnitude of the sweep in the serpentine truss, says the TT engineer. Once parameters were incorporated, TT and 360 Architecture met face-to-face or in web meetings to manipulate the geometry in real time and discuss aesthetic and structural options, along with potential concerns. The team would modify parameters and add new ones to explore other geometric options or solve potential problems. Eventually, TT incorporated more than 50 parameters into the model. For the project, TT maintains a master building information model. The engineer generates structural information models that can be translated into various file formats, using TT's proprietary exchange tools. "We were able to take advantage of the interoperability of the model to continually export the geometry to design software for analysis and eventually to drafting software to produce design drawings," says the TT engineer. The design team then shared the master BIM with the contractor, avoiding the extra step of the contractor creating a construction BIM. The BIM is helping the contractor understand the canopy's complex geometry. Still, TT is concerned about the canopy erection phase, which is scheduled to begin in October. "The level of safety [in Iraq] is not as good as ours by any means," says a TT engineer. One reason for concern is that tensile fabric roofs deflect more than conventional roofs, both during construction and thereafter. TT made certain assumptions in the design that make it imperative to erect the canopy in a certain way to avoid introducing different stresses and deflections. To guide the contractor, TT put a detailed canopy erection sequence on its drawings—crane and all. If the erector decides to change the sequence, it must reanalyze the roof, says the TT engineer. In general, despite all the difficulties, the architect is upbeat about the project. "There was a lot of learning curve on the first stadium. Al-Menaa is going more smoothly. We think it's a huge success," he says.